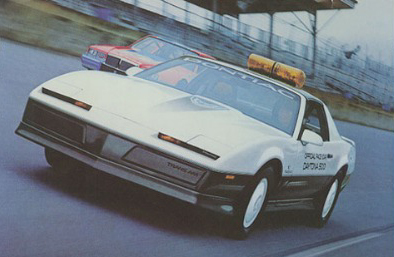 In 1983 the Pontiac Trans Am was selected to pace the 25th Daytona 500. To commemorate this event 2500 limited edition Trans Ams were built. Officially called the 25th Anniversary Daytona 500 Pace Car. Only 2500 of this model where ever built. 1980 of them where built with the legendary Crossfire Injection 305 producing 175hp and mated with an automatic transmission. Only 520 where built with the LG4-5.0 Liter Engine producing 150hp and mated with the new for '83 T5 five speed transmission. The WS6 suspension package which included rear disc-brakes was also standard equipment.